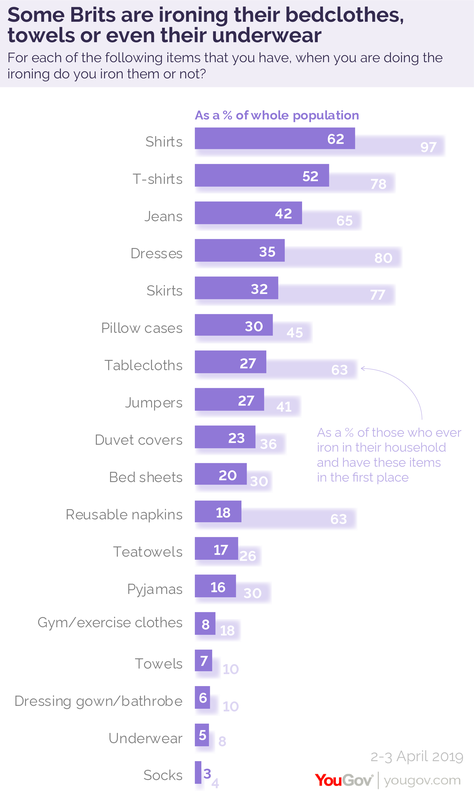 Previous YouGov Realtime research found that ironing is Britain’s least favourite household job: 50% dislike it, and just 16% take pleasure from it. Which makes our latest ironing research showing that some Britons are taking the time to press socks, underwear and even towels all the more surprising. Three in ten Britons (30%) say they iron their pillow cases, 23% say they press their duvet covers and 20% smooth out their bedsheets. Aside from wanting their beds to look sharp, some Britons want to look similarly well turned out at bed time: 16% say that they iron their pyjamas and 6% their dressing gown. Even simple rectangles of fabric are getting neat treatment: 17% are de-creasing their tea towels and 7% are even ironing towels. The fact that no-one looks good exercising isn’t stopping about one in twelve Britons (8%) from pressing their gym clothes, either. Perhaps the strangest result – given that nobody will see them – is that 5% are ironing their underwear, and 3% their socks. The study found that two thirds of Britons (67%) ever do the ironing in their household, with women substantially more likely to do so than men (77% versus 56%). The ironing habits seem to suggest that women are more house-proud than men. In the dining room we can see that women who ever do the ironing are more likely to iron their tablecloths and reusable napkins than men who iron. And in the bedroom female ironers are more likely to iron duvet covers and pillow cases but not bedsheets – perhaps because the former are on display but not the latter.